Spartak took the lead in the 16th minute through Edgar Gess and did not relinquish their advantage. Some fans, eager to escape the harsh conditions, began to make for the exit shortly before full time. Sergei Shevtsov added a second goal for Spartak to make it 2-0 with seconds remaining. But by then, the tragedy was well under way. Over 30 years on, it is extraordinarily difficult to separate the truth from the fiction and obtain an accurate picture of what transpired on that day. The only facts are that 66 people lost their lives on that day, and 61 more were injured in a crush on their way out of the stadium. Even these figures are subject to debate, but are generally accepted, including by the late Leonid Romanov, former head of the Spartak fan club. Shpeyer, in addition, contends that all the gates were open; the majority of the fans simply chose to utilize the one closest to the Metro station. Such a simple explanation absolves the authorities of any responsibility and reduces the entire affair to a matter of chance. A convenient one for the officials, surely, but how accurate is it? There is another version of events that implicates some of the more rowdy fans but places most of the blame those in charge. Vladimir Alyoshin, who became the director of the stadium just months after the disaster, supports this view. He contended in a 2007 interview with Sport-Ekspress that the policemen, in their attempt to seize the troublemakers from the crowd, created the dangerous conditions that directly led to the catastrophe. He lamented the fact that though most people now accept that the police were responsible, they have not been brought to justice. Before it was all over, 66 people had perished. 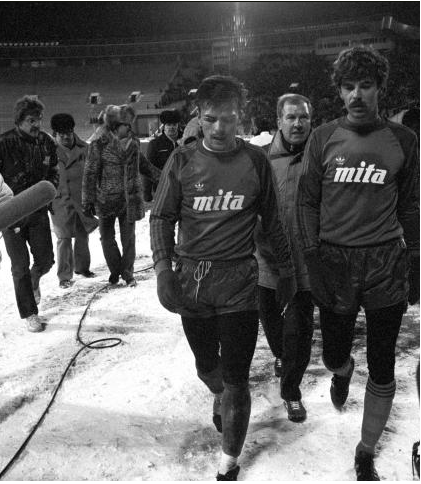 But it would be seven years until Spartak fans and the Soviet people learned of the disaster. In classic Soviet fashion, news of the disaster were suppressed and scapegoats were quickly identified. The political situation was tense; Leonid Brezhnev was weeks from death, and Yuri Andorpov had not yet been declared his successor. High level Soviet authorities clearly had bigger fish to fry that deal with the deaths of some football hooligans, but a cover up was still necessary. Four officials were implicated: the aforementioned director Viktor Kokryshev, stadium manager Yuri Panchikhin, Deputy Director K. Lyzhin and police chief Major Koryagin, who was in charge of the police at the East Stand. The disaster occurred on a Wednesday. On that Friday a meeting of the Moscow City Communist Party Committee took place. An official of the Ministry of the Interior announced that the investigation was completed, the causes of the disaster were identified, and that the guilty would be punished. The Moscow prosecutor proclaimed that “the preliminary investigation has revealed that, at the fault of the stadium officials, the gates meant to be used as an exit for the supporters were closed .” The so-called preliminary investigation took place without interviewing witnesses, gathering evidence, or doing any actual investigatory work. But the Party had spoken. When the Deputy Director of the Sporting Committee of the USSR attempted to defend Kokryshev, he was told by the First Secretary to not defend criminals. Kokryshev was duly expelled from the Communist Party. The farcical trial of Kokryshev and Panchikhin took place in February of 1983; both were presumed guilty. They each received 3 years in prison, but as a result of the amnesty on the occasion of the 60th anniversary of the formation of the USSR, Kokryshev did not serve any time and Panchikhin’s sentence was reduced to 1.5 years. Lyzhin, a World War II veteran, did not stand trial after a heart attack, while Major Koryagin was given amnesty for injuries sustained while attempting to prevent more people from entering the crush. As for the deceased, they were taken to several morgues around the city. Thirteen days later they were buried at different cemeteries so as to prevent the construction of a monument and a place of pilgrimage for the victims’ families. For that same reason, for the next several years no matches took place at the Luzhniki in late October, though the official explanation for this was the poor state of the grass. The cover up was complete. There was little in the way of meaningful dissent, which was simply impossible in early 80s Soviet society. Though Detective Shpeyer’s account of the tragedy may be inadequate, his statement that the lack of coverage has less to do with the explicit actions of the authorities, but rather was a result of “the socio-political situation that existed in the country at the time” rings true. But the socio-political situation was about to change drastically. The late 1980s under the new General Secretary Mikhail Gorbachev same a liberalization of Soviet society. Two new policies, Glasnost (openness) and Perestroika (restructuring), paved the way for an unheard of degree of press freedom. Pressure on the government was rising from all segments of society, especially in the aftermath of the Chernobyl Disaster, the implications of which were too great for even the Soviet authorities to cover them up. And yet, it happened, and, extraordinarily for a Soviet publication, they began to point fingers at the authorities. The officials at Luzhniki were criticized for ushering all the fans into just one stand. But the brunt of their criticism was directed at the police and the nightmarish narrow passageway out of the stadium which the newspaper alleged was the only available exit, an allegation denied by Shpeyer. Shpeyer also rejected the accusations that the police had anything to do with the disaster whatsoever; in the interview in Izvestiya, which came out shortly after the Sovetsky Sport article, he claimed that the police were not even present when the crush took place, a claim he supports by the purported lack of injured officers. Yet Major Koryagin himself was seriously hurt; something about Shpeyer’s account seems suspect. It must be said, that everything written about the disaster so many years after the fact must be taken with a grain of salt. Sovetsky Sport’s article proved inflammatory and sensationalist. Their speculations regarding the number of dead being in the hundreds were unfounded, yet were seized upon by the international media to such a rabid extent that somehow the figure of 340 fatalities became accepted as accurate. Even to this day, it is often cited; in his exhaustive football history The Ball is Round David Goldblatt’ makes reference to “over 300 killed.” Sovetsky Sport later published an article admitting to exaggeration and sensationalism. But the haphazard reporting should not distract from the significance of the moment. The facts may have been distorted, but the sheer existence of such a critical voice in the media is indicative of a sociopolitical environment in the Soviet Union drastically different from that which existed seven year prior. We will probably never learn who was responsible for the tragedy. Was only gate open, as Sovetsky Sport alleged, or were most of the fans just in a hurry to get home and thus rushed for the closest exit? Did police presence exacerbate the situation, or were they absent entirely? If there is a responsible party, at this point in time they have surely escaped justice. The only truth we know is that 66 people, many of them adolescents, went to see a football match and never returned. After the revelations of the Glasnost era and the fall of the Soviet Union, the knowledge of the tragedy became widespread. 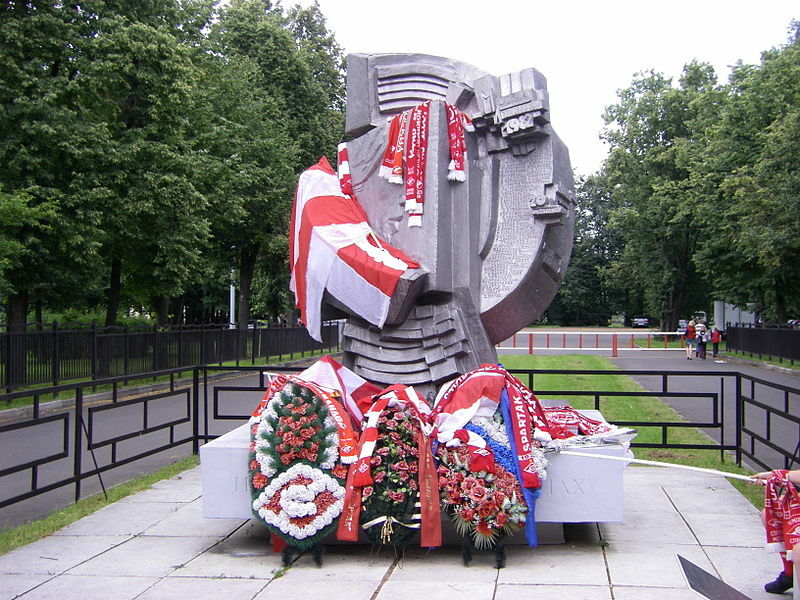 A monument was finally erected in 1992, the ten year anniversary, and on the 25th anniversary in 2007 a commemorative match was played between former players of Spartak and Haarlem. The Luzhniki stadium was renovated in the mid 1990s and is now a UEFA Category 4 Stadium. It hosted the 2008 UEFA Champions League Final between Manchester United and Chelsea, and is slated to be the venue of the 2018 FIFA World Cup Final. One hopes that the 66 people who lost their lives on October 20, 1982, will not be forgotten during the festivities. The press archives at Двадцатое число, the project dedicated to the memory of the victims of the Luzhniki Disaster, were an invaluable resource for this article.